State boundaries don’t always accurately encapsulate the cultures that reside within the borders. Cities, however, and the metropolitan areas that orbit them, operate far more cohesively as political and economic units. Although city-states aren’t as prevalent today as they were several hundred years ago, analyzing geographic “city-states” in the US today can help us understand larger trends and power dynamics within states. States are undoubtedly the dominant political entities in modern America, but this map imagines what the country would look like if that wasn’t true. 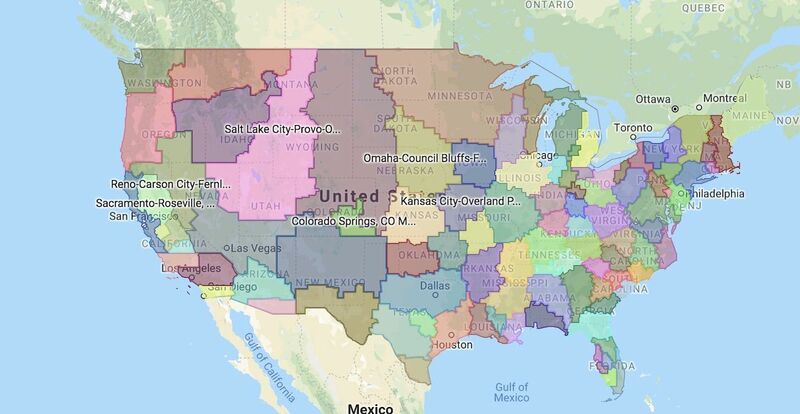 It paints a picture of the US with city-state boundaries, rather than just state borders, in an effort to show a more accurate political, cultural, and economic reality. City Planner Nolan Gray created this map of 100 city-states. He started by listing the top 150 metropolitan statistical areas in the US, then cutting that list to the top 100 units by population. Then he used census data to create “city-state cores” and assigned each county to a broader city-state core. While an actual city-state restructuring of the US is unlikely, the visual does lead to some pretty interesting takeaways. East of the Mississippi River, the city-states look rather chaotic. They are generally small, densely populated areas with economies that often depend upon one another, and therefore boundary lines aren’t quite as clean as they are out West. Compared to the East Coast, the rest of the country appears strikingly underpopulated, with city-states growing much larger and encompassing a broader geographic area. This is mainly illustrated by the neighboring Denver-Aurora and Salt Lake City-Provo-Orem city-states, which together seem to comprise nearly half the country. Some states would even be completely erased by their new city-state identities. The upper Mountain West, for example, as well as New Hampshire and Vermont, lack any major cities and would become simply become enveloped in city-states. As populations in both rural and urban areas continue to grow, however, new city-states are emerging all the time, meaning this map could look entirely different in just a few years.